Ok so you know when you look at a house online and ooo-aahh over the photos? Love the lounge! Love the bathroom. Oh and look at the lovely shiny wooden floorboards? Well we did that. Saw our new house aka The Project on RightMove and booked a viewing for the next day. We guessed from the price that it needed work but Boy oh Boy were we deceived! 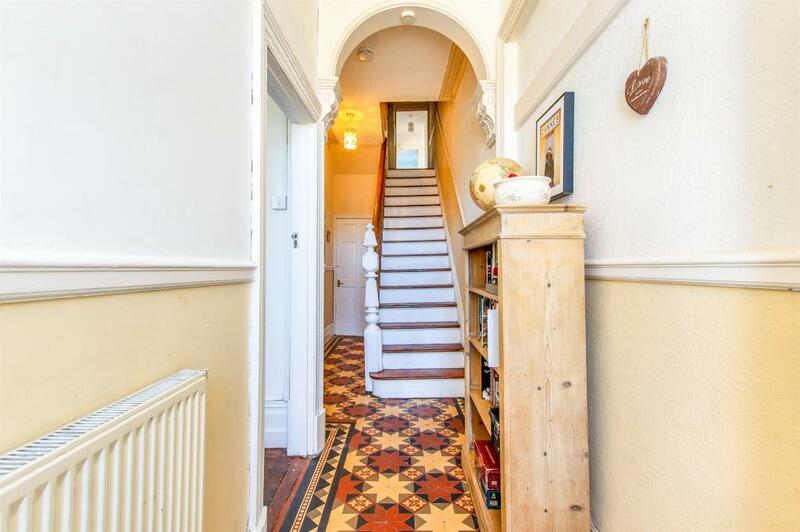 Mr Sweet Estate-Agent Man opened the door and we both immediately commented on the lovely Victorian tiles in the hall and the high ceilings. Exactly what we wanted. Having lived in modern houses most of my life I wanted something with a bit of character for a change. No more box-shaped rooms, plenty of alcoves, real wood floors and all the other things you expect to get in an older house. So that first visit, we walked into the living-room. Yes it needed a bit of attention on the ceiling above the bay window (Did I mention the gorgeous bays?) and we’d probably replace the haphazardly-placed shelf above the fireplace with a more rustic one. But we could live with that room. A new colour on the firebreast and it’d be perfect. Next, the kitchen. Mmmm … a bit small but newly-fitted with real wooden worktops and a mix of old original cupboards and IKEA ones. You wouldn’t think it would work but it did and does. Anyway that kitchen is only going to be the kitchen until the kitchen diner is refurbished. Well when I say ‘refurbed’ what I actually mean is ‘started from scratch’! We even have to dig out the floor and make new walls and a ceiling before we can even start fitting it out. Obviously though we could see that when we looked around. This room, like the utility room and the downstairs loo, were a virtual blank canvas and clearly need to be sorted out. To be honest, most of the house needs ‘doing’ but as I just said, we thought there were at least some liveable rooms. Pah! Once the clearly very strange family moved out and took their furniture with them we saw the reality. Previous Owners Painted Around Furniture! On Moving Day, we saw that, only had they painted around their furniture on the floor but they had painted around it on the walls too! Our lounge floor has marks where our sofas are smaller than theirs were. They must have had a huge coffee table as we’ve had to put a rug under ours to hide the box shaped outline around it. This is the same floor as in the above image. So was original pic photoshopped? I mean what sort of people do that? Go to the effort of stripping and varnishing wooden floors and then not moving their furniture!? And in the bedroom, another room, we thought just needed a change of decor? Well here, they had painted around their bed, their wardrobes, their dressing table … Not just on the floor but on the walls too. These are things you can’t see when you look around a house. Nobody moves beds to check the floor is stained underneath too. Nobody looks to see if the wall is painted behind the headboard or the wardrobe. Well perhaps we should. And don’t get me started on the bathroom. Again, this was a room which looked like it had been newly-fitted. A nice big, in fact huge, bath in the middle of the floor, the room just needed a fresh coat of paint to make it ours. Well that’s what we thought anyway. The first time we went to run the bath, the water came tumbling through the ceiling below into the utility room. Now here we were fortunate as the utility room was one of the rooms which needed a new ceiling. Nonetheless this was clearly another setback. Turns out the plumbing wasn’t even connected up properly. They had made the room ‘look’ like a great bathroom but it was totally non-functional. The minute water went down the plughole, it had nowhere to go but through the ceiling below. We knew the house needed new windows and doors. We knew the house needed extensive work. We knew there was going to be a lot of wallpaper-stripping and painting going on. BUT, the rest of it? All smoke and mirrors! Turns out that there’s not one single room that doesn’t need some serious attention and TLC. Now we’re wondering if Mr. S.E.A.M (see above) advised them to ‘do up’ a few rooms for their marketing material or were they just an amoral, duplicitous couple who wanted to sell at all costs and didn’t care about the aftermath? I hope Mr 50 Plus realises how busy he’s going to be over the next year! DEcade?